So what are “corked” or “cork-tainted” wines? 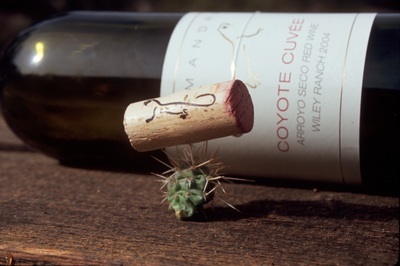 After all, the vast majority of California wines, and until recently, wines of the world, come with corks in the neck. Cork is, after all, oak tree bark, raised in Portugal under great scrutiny, harvested meticulously without killing the tree, die cut into cylinders, and processed with keen, modern quality control. Tiny pores in the cork are natural, but they can hold natural resins and other materials, and some of these may interact with molds or traces of the bleaching and sterilizing agents, creating compounds with off odors. These materials can leach into the wine after bottling. “Corked” wines not only have the distinctive smell—anywhere from subtle to severe—but the normal fruity characters of the wine are flattened or obliterated. With mild “corkiness,” some people may not recognize the flaw as the cause, just think instead that the winery is no good. So in a paradoxical way, winemakers hope that if one of their wines is “corked,” they hope it is miserably, incontrovertibly, in-your-face corked…and they will hope for a second chance to please you (see below). At Salamandre, we purchase the most expensive corks from a company which we regard as the best cork supplier, and we have seen the instances of “corky wines” decline substantially…but not to zero. We know this is awkward, because offending one out of 100 or so customers is a terrible “business plan” when longstanding personal relationships constitute both our pleasure and our future. One my memorable experiences with corked wines came while I was serving the young proprietors of a lovely new restaurant one of my most prideful wines—a Sauvignon Musqué full of ripe fig aromas with touches of honey. By that time, it had earned gold medals in 3 competitions, and it remains one of my all time favorites. I served it with a flourish, expecting a warm wave of accolades and smiles, only to see instead the telltale bunching of their eyebrows. Uh oh. I smelled it and yelped: “ Expletive …this wine is corked!” They were perplexed. So I said: “Let me show you.” I pulled an adjacent bottle from the same box, and meanwhile prayed that this would not be the day that my accumulated transgressions would be punished in public. Happily, the second bottle was ravishingly delicious, and they thanked me for the lesson, kept the bad bottle to teach waitstaff, and ordered a case. Great save …but what if the first bottle was their only experience with Salamandre? It probably would have been the last. I don't want any customer to have a “one and out” experience with us…really, we're better than that! When one of our customers opens a Salamandre bottle less than 5 years old with a bona fide “corked” character, let us know. You do not need to save the wine (yuck), but we would definitely want to have that cork. We will replace your bottle with one of comparable heritage and price. What about screw caps? With very rare exception, screw cap finished wines have surpassed cork finished wines in blind tastings. Virtually all of the Aussie and New Zealand wines, including their priciest prestige bottlings, are now capped. California wineries are picking up the trend, and Salamandre eventually will, too. Meanwhile, we just love that “plop” when the cork comes out and the Pavlovian grins spread across our faces. “Not what I expected.” Some patrons will order a wine that they simply don't like…or one which is not what they expected…and they'll send it back, despite the fact the wine is perfectly sound. That's not fair, guys. That opened bottle was bought but cannot be re-sold. The customer should either order something he or she knows very well, or buy wine by the glass, or else be willing to expand his or her horizons with something new. “Late call.” Occasionally, a patron will nod “OK” to the initial taste, then pour half the bottle, only to decide that it's not “good,” and ask for a replacement. That's rather awkward, friends. If the first bottle really was corked or “bad” in some other way, best to raise your hand early. If it dawns on you later, certainly don't drink something you find troubling, but if half that bottle has found refuge in your tummy, try to make some gracious overture to your hosts. That usually involves another purchase. My advice? When in doubt, ask the waiter's or the proprietor's advice! Really—you will put your pleasure in the hands of someone who is going to be personally motivated for you enjoy the experience!